The Greater Phoenix Chamber of Commerce (GPCC) with the support of key partners and stakeholders manages a Business, Retention and Expansion (BRE) program. Through a robust BRE program, GPCC meets with companies in targeted industry sectors. With a focus learning about the pain points businesses experience, the GPCC BRE team discusses the barriers a business faces as they try to grow and expand. Business owners are then connected to key community resources to help them overcome those challenges and grow their business. The BRE team bridges the gap and assists with permitting or logistical issues with the local government and connects business owners to funding resources, such as grants to help them and their employees grow. In less than three years, the BRE team and GPCC’s partners have conducted more than 2,800 visits and assisted hundreds of companies. So far in Fiscal Year 2018, the BRE team has conducted more than 100 visits, expanding to 600 when including partners Arizona Commerce Authority and the city of Phoenix. Through these visits, the team is able to help businesses access vital community resources to support their growth and continued economic vitally. Additionally, the BRE visits serve as a platform for GPCC to collect industry data and aggregate that information with data collected from community partners. This results in the development of actionable industry data that identifies trends and provides insights into economic growth strategies. 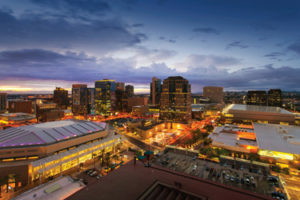 Recent findings from these visits are positive; Arizona’s economy is projected to grow. Roughly nine out of 10 companies anticipate increased revenue in 2018. Many of these companies plan to make significant capital investments in the Greater Phoenix region. Last quarter, 98 percent of companies visited rated the business climate as excellent or good. By all accounts, businesses are expected to continue to grow and expand. As businesses continue to grow and expand, GPCC will be ready and willing to help them connect with the resources they need to thrive. To request a business visit and consultation from the Chamber’s economic development professionals, contact Senior Economic Development Manager Greg Tilque at 602.495.6475 or email gtilque@phoenixchamber.com.